I approach it with chocolate. =) It's so true that it isn't personal. I have been the bearer of rejection many times, and I didn't ever think that the author was horrible or would never make it. It was just that a particular story didn't work for me. I was always happy when I was able to accept a great story from an author who'd been rejected before. You're so right. I know, I know. It's not personal. I get it. I'll repeat it. But I still sometimes allow myself a little bit of sulking and wallowing before I buck up and get on with it. A good reminder to look at both sides. Rejections on fulls are the worst! I have pretty thick skin when it comes to criticism or rejections, but that one's tough. So glad you found an agent who saw your story the way you did! When I first started querying agents two years ago, I did it in mass... dozens at a time! This was a bad idea, but it made rejection much easier. Now I thoroughly research an agent, decide we were meant to be together, and feel devastated when they say no. My advice to other writers; don't get too attached to individual agents! I think that's a fantastic way to approach rejection. I figure the story wasn't for them and move on to the next one. When I was rejected, I ate a lot of junk food and worked out like a mother. I'm glad to be back to blogging and see how you're doing. You're pretty awesome! 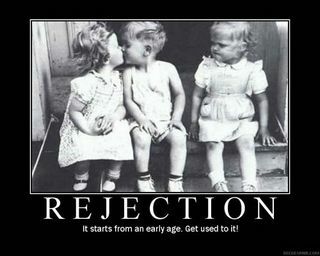 I took rejection very personally when I was first querying too briefly 10-11 years ago. The worst was being sent back all the materials unopened, returned to sender, after spending all that money to send it through the mail out of state. I'm glad most queries are done through e-mail these days, so you don't waste postage money or printer paper on a potential rejection. I agree with you Shallee, that rejection should not be taken personally. An agent/s may not connect with the story emotionally, maybe the plot is not up their alley, or the way a writer has handled it. All we have do is to keep writing and learning from these rejection. wow, choosing a direction? choosing representation from multiple offers? staggering! that is a whole nother set of worries! thanks for the perspective! I completely agree with you. It's a business, and it's so subjective. Great post! I'm another chocolate lover. I had a rejection this morning and I moped around a bit before I got back in the saddle, submitting it to somewhere else. Persistence is something I can do! A late congratulations on the agent! I disappear for a bit, and when I come back you've got an agent. Huge congrats! :) Great post. It's like how there are a bunch of guys in the world. Some you'll like, but in the end you only marry one. I think you're right, it just comes down to personal preference for an agent/and I would venture to say an editor as well. Although we'd love every query we sent out to be "the one" and everyone to love it, it's just not realistic because everyone's taste runs different. And that's a good thing in a way, because it means "the one" will champion our book more. Thanks for sharing your journey. It is tough to be rejected, and I can see the rejection of the full to be more painful than the rejection of the query. This post hits it on the head. It's exactly how it works. And you know what? That translates to readers too. Some readers just "get" your book and they love it. And others don't. I'm sure we've all felt that way about books we've read, right?